“Our task, then, is to remember and reclaim our indigenous souls and learn to truly live in balance with the land once again, yet in a new and creative way. In doing so, we will remember that we are good to the core, in the same way plants, animals, clouds and stars are good to the core”. Bill Pfeiffer’s approach to writing Wild Earth Wild Soul was twofold: to provide a blueprint for those wanting to experience a Wild Earth Intensive workshop and to explain the concepts that support the workshop activities. In this he has succeeded admirably, generously sharing an abundance of exercises as a manual for anyone wanting to facilitate the workshop. Ranging from group bonding activities and ‘trust exercises’; through traditional tools like storytelling and sweat lodges; to shamanic journeying and numerous others, these exercises also provide inspiration for all. Indeed the author urges you to “Adapt them to your own situations … If they do not speak to you, research and remember the Earth honouring practices of your own country, ancestry and bioregion. Substitute accordingly. Make them relevant to your indigenous soul wherever you live”. Equally valuable are the author’s informative explanations of the underlying concepts which include supporting references throughout from a wide range of Native elders, scientists, poets, thinkers and spiritual luminaries with an excellent reference section at the end of the book for further reading and research. 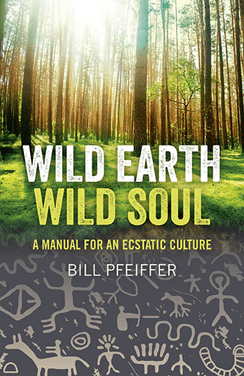 Bill Pfeiffer’s work is based on seven principles: there is power in remembering ancestral wisdom; we can dream a new world into being; we are a tribal species; the Earth is alive and full of meaning; humans naturally live in abundance; women and men are partners in a common destiny; ancient wisdom is mirrored by twenty-first century science. If any of these principles resonate within your soul you will find a lot of value in Wild Earth Wild Soul.